Every New Yorker has been there: After searching for and securing the perfect apartment, moving day comes and you just can’t get your favorite piece of furniture into the elevator or up the stairs. With movers on the clock, and stress setting in, you begin to consider ditching your couch altogether. But instead, you take a deep breath, grab your phone, and let Sal Giangrande come to the rescue. 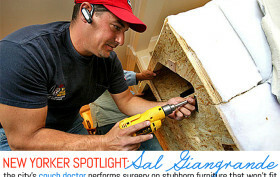 Like knights in shining armor on moving day, Sal and his team over at New York Couch Doctor are experts at disassembling and reassembling everything from couches to pool tables to box springs. They liken their precision to that of surgeons, cutting into and stitching back together dressers and entertainment centers seam unseen (for the most part). And, like surgeons, they’re on call 24 hours a day. We recently chatted with Sal to learn more about his days being New York’s go-to furniture doctor.